Something I know I'm missing from "The Wire" is typical romantic tension. So far, there's been no “will-they-or-won't-they” dynamic between any of the characters of the show’s groupings. This could be considered another element of "The Wire's" realism. I'm a sucker for a good romantic subplot ("Arrow," more recently, has done a fantastic job with #Olicity) but I don't know if "The Wire" would truly benefit from, say, Prez and Russell getting together. It's just not that type of show. It’s just a “me” thing: I don't know how to watch TV without "shipping." But back to the main drama, involving shipping crates. Preston “Boadie” Broadus plans D’Angelo Barksdale’s funeral, which many of the Barksdale operation attend. The funeral fashion was on point, as grim as the occasion was. Stringer Bell has not told Avon Barksdale of his involvement in D’Angelo’s death. Meanwhile, Frank Sobotka faces changes to the shipping industry and deals with political issues and his union. A dock worker nicknamed “New Charles” (Stan Stewart, “ABCDad”) sustains a major leg injury when a piece of cargo traps him. The leg must be amputated, and Frank provides the family with money. The Sobotka detail, now almost identical to the Season One Barksdale detail, continues to monitor the shipping crates and attempts to connect the drug trade and the dead girls from the shipping crate to the stevedores. Kima Greggs and Roland “Prez” Pryzbylewski identify a possible origin to the girls’ prostitutional backgrounds. McNulty attempts to reconnect with his wife, Elena, and his children. After a brief drunk driving accident, McNulty is somehow taken off marine duty and put on the Sobotka/shipping crate girls case with the rest of his former detail. He agrees to go undercover to the apartment where the prostitutes who are linked to the deaths of the girls work. No one is surprised by McNulty’s talents in this area. Ellis Carver and Thomas “Herc” Hauk forge some of the evidence regarding the connection between the drug trade and the Sobotkas. The detail attempts to gain permission for a wiretap on several stevedore phone numbers. However, Frank Sobotka becomes aware of the detail’s surveillance and sends out a decoy shipping container. Frank discusses the police activity with The Greek. Meanwhile, Ziggy Sobotka purchases a pet duck. Boadie and Malick “Poot” Carr patrol their area and defend their streets against rival dealers. Couldn't tell if I should laugh or cringe at the gang-themed flower arrangements Boadie was looking to purchase for D’Angelo’s funeral. Nicky Sobotka in that flannel shirt and his Timberland boots is super cute. I think I’m finally over the whole “he’s Pornstache from “Orange is the New Black” thing. Prez is the real MVP of this investigation. I really empathize with Frank Sobotka's anger and am a little jarred by his scenes, because Chris Bauer's angry outbursts as Andy Bellefleur on “True Blood” were always played for laughs. Whenever people talk to each other through prison glass, I think of Legally Blonde. "LIPOSUCTION!!" It's getting to the point where I see TV characters being happy and I know that it won't last. This goes for both Nick Sobotka and his girlfriend, Aimee, and McNulty and Elena. I don't understand how bartenders serve McNulty and/or believe him when he says he isn't driving home. Or how his drunk driving hasn't gotten him into trouble before, because he seems to do this a lot. They're getting another wiretap! It’s the thing! 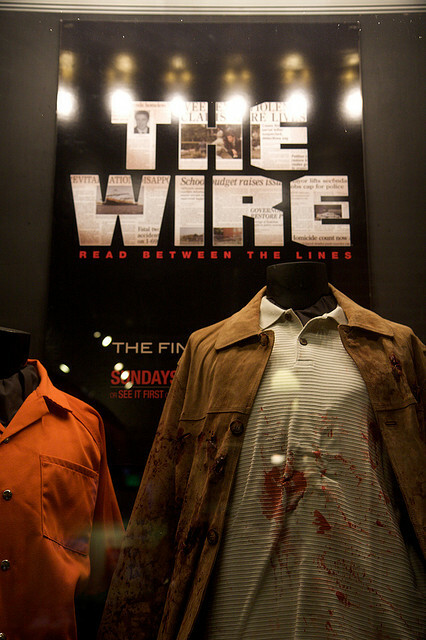 The wire! Bunk plays lacrosse. This is a great reveal. Another realistic aspect of "The Wire": how much paperwork police have to do. Ziggy bought a duck. I hope it doesn't die. Again with the pessimism! I also felt sad when they gave the duck whiskey. That’s not good for a duck! Russell: "After one [beer] I get sleepy." McNulty: "Me too." Okay, I giggled at that exchange, considering McNulty once did fourteen shots of Jameson.